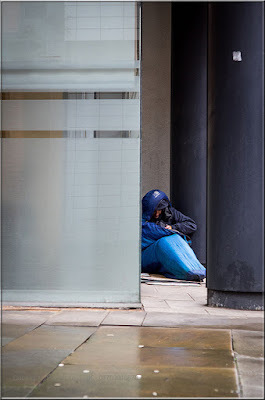 Homelessness is like a foreign country. It's like being dropped into the middle of nowhere. The first thing you need is somewhere safe, not just dry but a safe place most of all. Then food, dry clothes. Then you need to get a shower. Then try to get to know all the organisations that will help you because they're going to be your best friends. They are the lifelines, not other people who are homeless. For me my first night it was throwing it down raining just before Halloween when the winter kicks in. I used to sleep in the gardens under the bench for the first few months. Didn't know if I'd wake up in the morning. It was a blessing if I did. Close my eyes and I can put myself back there. You don't have friends you have associates. You never know if you can trust them as people move on all the time. You don't know if you see them tomorrow or if you'll ever see them again. You've got to know someone to trust them. 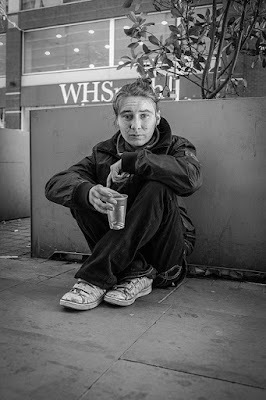 I slept in Piccadilly Gardens in the city centre because it was where I felt safe. It was open and I knew the area was camera-ed with CCTV. I could shout for help. If you're out in some park under a tree and something happens no one will hear you. I used to sleep for about an hour or an hour and a half. You don't really sleep you've got one eye open. There is the noise of the traffic, people passing by. You go to sleep with exhaustion. I've woke up and my trainers were gone. You don't feel them going but you feel the cold on your feet, that cold will wake you up alright. I've woken up with no laces in my trainers. I don't know how they do it steal the laces from your shoes while you sleep. I used to go to Cornerstones. I'd walk up Oxford Road to Cornerstones. Sit outside the doorstep on Denmark Road. Inside sat there reading the paper all day propping yourself on the table. The manager she does her best. Leave about 4pm, walk back to the gardens late afternoon to early evening and wait for them to come out with hot food again. The Mustard Tree opens late on a Friday, comfy chairs and you're inside. That's the highlight of the week they all talk about it, the homeless ones. The staff don't rush you to leave they know you will be back on the streets. They know you appreciate a comfy chair and a plate of hot food in front of you - won't be in a hurry to go back down them stairs. Then there is Danzig Street but there's been a lot of murders in the showers. Danzig Street years ago was a school; you can still see the rooms are like classrooms. It opens at six in the morning it's for homeless people who are up at that time. On Piccadilly Gardens I could see people in view, but I wouldn't associate too close. A lot on the streets take drugs, I don't. I remember talking to a minister and he said you will go on drugs if you stay on the street. But I've always been strong enough to say no. Only drugs I take are ones given by my doctor. Drugs and alcohol. Their eyes are gone and when they get beaten up for their money they don't even know who's done it. Down on Piccadilly it's like they're just waiting for new drugs. I take pictures of them all the time on my phone (shows phone picture). Try to shame them out of it. This one had been taking legal highs. Legal highs and all that. Guy the other day turning grey, dying in front of me. I showed a couple of Polish guys a picture of themselves, they said, "No way were we like that!" I said, "There is the picture you were hanging off the bench eyes shut." I said, "There is nothing to be proud of." When you mix legal highs with alcohol you go grey and near die. Homelessness - what you gain is understanding. Then you pass on the information you find. That's how conversations often start for me. Before today I've been called the Ambassador of Piccadilly Gardens. Them Community Police Officers said I should be the Ambassador. They said I've got respect and trust from the homeless. Trust is priceless. If people know you've been on the streets they know you've been through it too. I've got a bond with them, been homeless myself. I don't cause trouble I try to help. Yesterday I spoke to a young lad, a babyface. It was raining and I got him an umbrella - you should've seen him smile. I can afford to buy an umbrella now. Said he was called Ryan, I don't know, it could've been his street name. People are running away on the streets. They often have a street name. Could've been anything in his life: violence, family stuff, death. 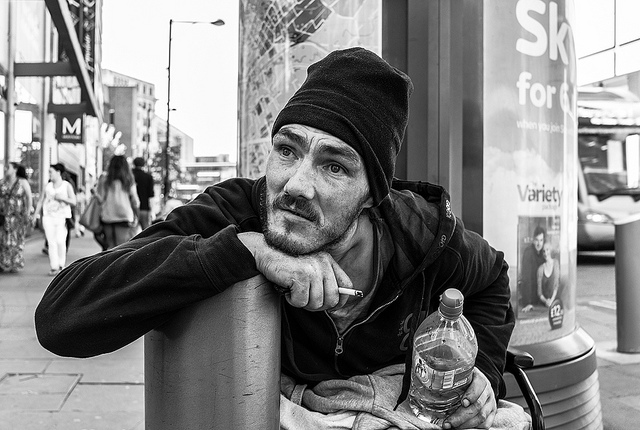 Living on the street is sometimes people's way of grieving. I did socialise I used to be in that circle. With each other they was always arguing over money drugs and beer. They used to know each other's pay days. "He gets paid on a Thursday." They couldn't seem to understand why they kept being robbed. When you're drunk on drugs you don't know what you're saying and who's listening. You tell someone who is addicted to whatever when you're getting money and where you cash it and what do you think is going to happen? Let me guess you got mugged when you got your money. Piccadilly politics they call it, knowing everybody's business. People say "I'm getting DLA tomorrow" and next thing they got a broken nose and black eyes, what a surprise. People want to be in the circle because then they feel protected rather than walking the streets on their own. I used to be with them but I knew when to be quiet and just listen. I knew when to keep me own business to me self. I'd go off and do my stuff by myself. But to get help or to help someone else you have to have trust - and there wasn't a lot of trust out there. 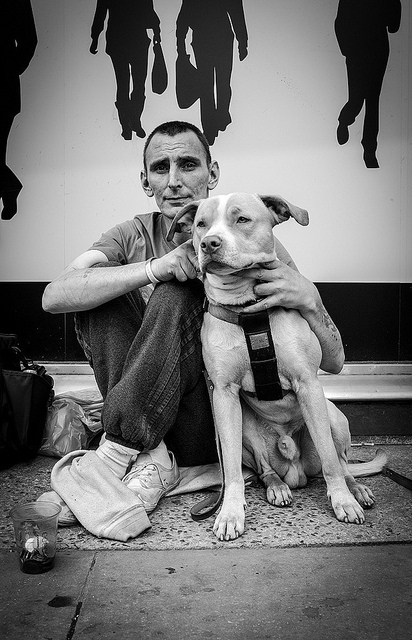 The beautiful, sensitive photos are taken by Manchester photographer Paul Jones and are shared here with his permission.